This four day workshop is suitable for beginners and valuable for continuing students. Although, Pranayama, meditation and asana practice will be an essential part of the workshop, we will discuss in some depth as to why and how are these practices relevant today based on the ancient Patanjali Yoga Sutras. The explanation of the sutras will not be a mere intellectual exercise but it will be based on their practical applications in the modern day world especially in light of the stresses and challenges we face in our daily lives. Sri Sudhir Tiwari is the eldest son of our beloved and highly respected teacher Sri O.P. Tiwari. 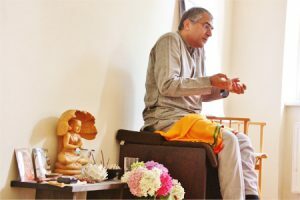 Sudhir was brought up at Kaivalyadham Yoga Institute, in Lonavala, India, amidst rich traditional yogic heritage of Swami Madhavdasji Maharaj, Swami Kuvalyanandaji and Swami Digambarji. Swami Digambarji initiated Sudhir in 1981 and accepted him as a disciple. Sudhir received his primary and advanced Yogic and Ayurvedic training from Swami Digambarji which included the study of traditional texts, mantra yoga, fire ceremony, pranayama and various aspects of adhyatm (spiritual) yoga. Sudhir also learnt pranayama and Hathapradipika from his father. When you meet Sudhir, you will know he has lived and breathed yoga his whole life. He is such a humble, yet energetic and enthusiastic teacher with a mastery and knowledge of yoga you won´t be able to find very often. In his workshops you cannot only explore the tradition but also the scientific reasoning behind why we do the yogic practices. We will also be looking into ayurveda, yoga’s sister science, and why they are synergistic. Sudhir held workshops at Pureyoga in 2013, 2014 and 2015 and instantly he could gain a crowd of fans. Now we are very happy to welcome him for a workshop again. Achtung: Die TeilnehmerInnenzahl ist beschränkt. Die Plätze werden nach dem “First come, first serve” Prinzip vergeben!